Media captionAmber Rudd has been reported to police for comments in her Conservative conference speech. West Midlands Police has said the home secretary's speech to last year's Conservative Party conference is being treated as a "hate incident". In the speech, Amber Rudd suggested tightening rules that allow UK firms to recruit workers from overseas. An Oxford University professor complained to the force claiming Ms Rudd was using "hate speech" to foster support for her political aims. But West Midlands police said no crime had been committed. A Home Office spokesperson said: "This was not a hate crime. The Home Secretary has been crystal clear that hatred has absolutely no place in a Britain that works for everyone. "She's made countering hate one of her key priorities, indeed one of the first public interventions she made was to launch the Hate Crime Action Plan." Danny Shaw, BBC home affairs correspondent, said West Midlands Police had assessed the complaint but it had not been formally investigated. However, it had to be recorded as a "non-crime hate incident" in accordance with police national guidelines. These state: "Where any person, including police personnel, reports a hate incident which would not be the primary responsibility of another agency, it must be recorded regardless of whether or not they are the victim, and irrespective of whether there is any evidence to identify the hate element." Professor Joshua Silver, who made the complaint, told BBC News: "Some politicians have been using hate crime as an instrument to foster support for their political aims." He said he would consider whether the police response was "satisfactory" and said he was taking legal advice with a view to taking "further action". However, during an interview on BBC2's Daily Politics, Prof Silver admitted he had not listened to Ms Rudd's speech, which did not include any reference to keeping lists of foreign workers. "I didn't actually see the speech, but I've read the draft... I've read the speech carefully and I've looked at all the feedback," he said. "It's discriminating against foreigners - you pick on them and say we want to give jobs to British people and not to foreigners. It was interpreted that way." Former Conservative Home Secretary Michael Howard, speaking on the same programme, dismissed the claims. "Of course it wasn't a hate incident," he said. "What Amber Rudd said was no different from Gordon Brown [former Labour prime minister] when he said there should be British jobs for British workers. "I think Mr Silver should be thoroughly ashamed of himself because what he's doing is to bring a well-intentioned piece of legislation into disrepute." 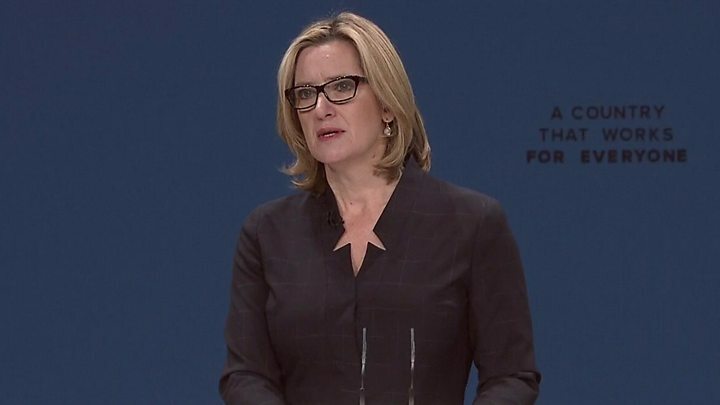 West Midlands Police said it was not aware that it had received any other complaints about Ms Rudd's speech, which provoked a furious row at the time. Asked on BBC Radio 4's Today programme whether she was prepared to "name and shame" companies which did not comply by publishing a breakdown of the nationality of their workforce, she said it was "not something we are definitely going to do" but it was "one of the tools" under review "as a way of nudging people into better behaviour".